as I see it: Red rain from another planet? On July 25, 2001, blood-red rain fell over Kerala. The unusual phenomenon continued for two months, raining crimson, turning clothes pink, burning leaves on trees. In some places, the rain fell in scarlet sheets. Scientists were shocked, and the government ordered an investigation. Scientists concluded that the rain was red because winds had swept up dust from Arabia and dumped it on Kerala. But Dr Godfrey Louis, a Reader in Physics at the School of Pure and Applied Physics at the Mahatma Gandhi University in Kottayam, Kerala, was not convinced. His colleagues -- other scientists and physicists -- frowned at the conclusion. But Dr Louis stuck to his theory. His scientific conclusions have now received international support. Dr Milton Wainwright of the micro-biology Department at Sheffield University in Britain has been examining some of the particles of the red rain samples that hit Kerala. And he has come out in support of Dr Louis' theory that the rains could belong to an alien life form. "I am indeed thrilled that my scientific conclusions have received international support and recognition," Dr Louis told rediff.com New Scientist Magazine, in its March cover story, has published the red rain phenomenon along with the doctor's theory. How did he come to this conclusion, we asked. Dr Louis says the phenomenon first occurred at the place close to where he lives in Kerala. "The characteristics were very strange. Conventional explanations appeared totally inadequate. I started an investigation with limited resources and was greatly assisted by my research student A Santhosh Kumar," he says. How did their investigations bring them to their interesting conclusion? "We arrived at it by analysing the various aspects associated with the phenomenon, like the geographical and time distribution pattern, and the nature of the particles," he says. The phenomenon can be explained easily if it is assumed that the origin of the red particles is from cometary fragments, which underwent atmospheric disintegration above Kerala. There is additional correlating evidences that prompts this line of thinking, like the sonic boom from the meteor airburst, which preceded the first red rain case. Having made a logical possibility like this, it follows that the cometary body in question should contain a huge quantity of these red particles, which amounts to an estimated quantity of more than 50,000 kg. What makes this finding most important is the biological cell-like nature of the particles. Under an optical microscope, they appear like biological cells. Transmission Electron Microscopy further shows a clear cell structure. Their organic nature is indicated by the major presence of carbon and oxygen. But, despite these biological indications, the cells do not show the presence of DNA. The genetic molecule DNA is present in all living organisms found on Earth, so the absence of DNA argues against the biological nature of these cells. There is thus the possibility of alternate biomolecules in these cells, whose origin is suspected as extraterrestrial. This way, the cells may represent an alternate form of life from space. If these are such biological cells, then their production in huge quantity inside cometary bodies can be explained by the theory of cometary panspermia. But, what if these new scientific ideas are wrong? Dr Louis says that, if they are, he wants a better explanation for the phenomenon and the strange nature of the cells. 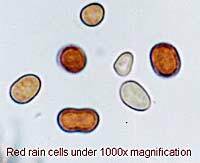 "If these cells have a terrestrial origin, then it follows that they exist in huge quantities in some part of the Earth and are sure to have been noticed by some microbiologists. But there appears to be no such identification so far," he says. Dr Louis' theory was initially ridiculed, but has now been accepted for research by international scientists like Dr Wainwright. His research has also been accepted for publication in the reputed international journal Astrophysics and Space Science. He is soon gearing up to publish the next set of results and conduct several collaborative studies to further unravel the mystery of the cells.